Welcome to the Bill Gove Golden Gavel Toastmasters Club! Ask yourself this question … What do you want in life? A new beautiful home? A new car? Finding or keeping a job or getting a promotion? Making more money? Or just keeping your speaking skills sharp? It’s no secret … if you communicate clearly and effectively, you’ll be very successful. No matter where you are. At work, at home or in your community. And there’s no better place to develop these priceless skills than here. One of the best Toastmasters Clubs around. 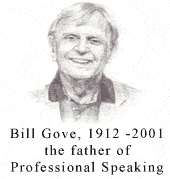 Inspired by our own Bill Gove, the father of professional speaking. You’ll learn to speak confidently … think quickly on your feet … listen effectively ... gain valuable leadership skills … develop self-confidence and overcome shyness or fear – and much more. These are important skills you need today, especially in these tough economic times. They’ll give you a clear competitive edge. And a vital tool, video recordings of your speeches, for you to review at home. As a result, you’ll build confidence each time you speak. Your quick growth in speaking and leadership will make a big difference in your life. You’ll find that our club is one of a kind. It’s just the most competent, fun and affordable way you can grow as a speaker and leader — guaranteed! Plan now to attend a club meeting — and see how it can help you become even more successful — quicker!